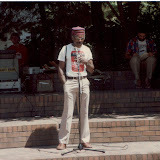 On April 20, 1983, PCASC held a rally at the Armed Forces Recruiting Station in protest of the war in Nicaragua. This action was significant because of the diversity of speakers, participants, and organizations involved in speaking out against the wars in Central America. Ben Sasway spoke about being a draft resister and recounted his conviction by the Reagan administration. Guests from the Portland Committee for Unemployed Action, the American Indian Movement, the National Organization for Women, the Japanese American Citizens League, the Gray Panthers, the Campus Christian Ministry, the American Friends Service Committee, the Lewis and Clark Latin American Coalition, and the Black United Front all spoke for a few minutes. Mass mailings and a phone-tree were used to contact people regarding the rally. A second rally was held on January 12 to protest and sign a petition against the Kissinger commission.